We had to leave Al-Taif around 9 am to reach Jeddah at noon. 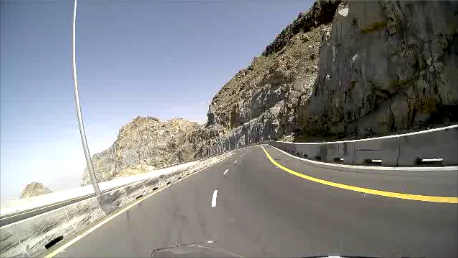 So we took a shorter mountainous road (Al-Hada Road) which had a great view and was very twisty and a great motorcycle road. We got to the port and with the assitance of Ali's contacts we were able to finalize the handling of customs and paper work for going on the ferry. Special thanks go to Mr. Rasheed Baaboud & Steve for their support I hope you are reading this. By 1 pm we had delivered our bikes and stayed in a close hotel until 5 pm when we went to the port to leave Saudi Arabia and get on the ferry. This is when we felt the presence of Africa where there is no particular schedule for the ferry and time has no significant importance. We were on the ferry at 5:30 pm, put the bikes in the ferry by 10 pm, and managed to actually depart by 1 am. We also noticed that there is no personal space here people used our luggage as pillows by the fact that they were on the bench. The ferry has no cabins so everyone stays in the general seating. The issue is that there are two classes on the ferry, the deluxe accommodations for the families (men with accompanied woman, and women by themselves), and the not so deluxe accommodations for the bachelor men. This is where having your wife with you on a trip helps. كان مفروض نمشي اليوم بس انا تعبان شوية (منشول) فقررنا نرتاح اليوم و باشر انبات قرب الحدود الأثيوبية. We are driving to Uganda in August and hope to cross with this ferry. Our route has changed many times due to the conflict in Libya, Syria etc so we now are going Turkey, Iran, Kuwaite, Saudi, Sudan.